Bearded Dragon | Zoo Med Laboratories, Inc.
Bearded Dragons are among the most popular pet reptiles in the hobby. Their interesting behaviors and docile nature make them an excellent pet for first time reptile hobbyists. All Bearded Dragons found in the USA are captive bred. Many different color morphs are becoming available making the Bearded Dragon a great choice for any level reptile keeper. Juvenile Bearded Dragons need a minimum 20 gallon terrarium. Juveniles can be housed together in a 30 gallon terrarium. Adult Bearded Dragons need a minimum 40+ gallon terrarium. Thick branches, rocks or Mopani Wood is an excellent choice for climbing and basking. A nighttime drop in temperature is natural and can be accomplished by turning off all overhead heating devices, and leaving a ReptiTherm® under tank heater (UTH) on 24 hours a day. Zoo Med’s Basking Spot Lamp, PowerSun®, Repti Halogen, Ceramic Heat Emitters, and ReptiTherm® UTH are good choices for heating Bearded Dragon enclosures. 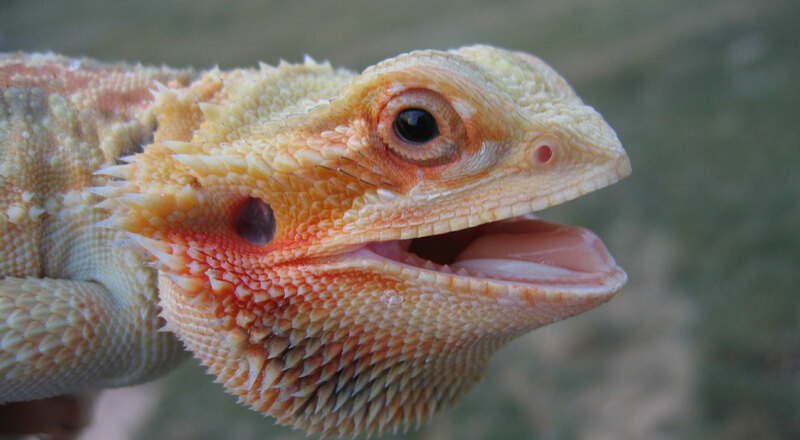 UVB lighting and heat are essential for Bearded Dragons to process calcium in captivity. Without UVB lighting Bearded Dragons will develop serious health problems such as Metabolic Bone Disease (MBD). Zoo Med’s ReptiSun® linear and compact fluorescent lamps are a great choice for providing Bearded Dragons with UVB. The PowerSun® is an excellent way to provide both UVB and basking heat all in one lamp! Bearded Dragons live in arid, sandy places in the wild and will do well on a variety of sand-type substrates in captivity. Hatchling Bearded Dragons will do best on Cage Carpet such as Zoo Med’s Eco Carpet. Excavator™ Clay Burrowing Substrate will allow you to create a naturalistic terrarium complete with burrows and tunnels for your animals. ReptiSand® and ReptiFresh® are also excellent choices for housing Bearded Dragons. Bearded Dragons are omnivorous reptiles that change their diet throughout their lives. Juveniles will need to be fed pinhead to small size crickets daily along with other small insects such as mealworms. Zoo Med offers a variety of Can O’ insects and canned diets that will make offering a varied diet convenient. Collard or Dandelion Greens, Romaine lettuce, and other veggies can be offered 1-2 times per week. Always remove uneaten food after each feeding.